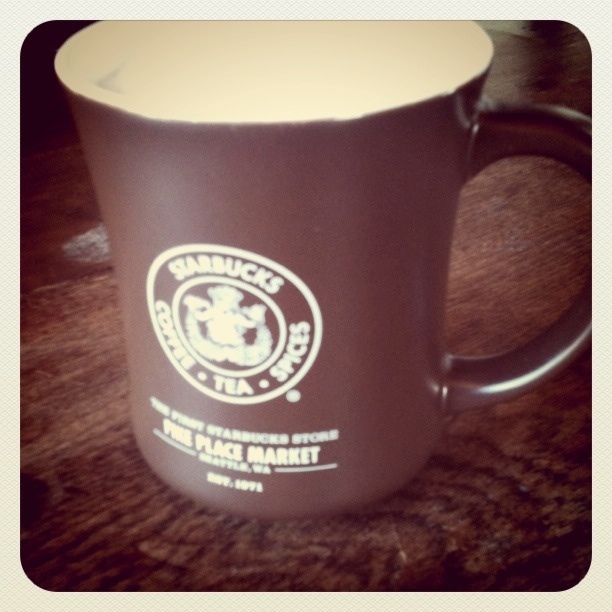 I love Starbucks coffee mugs! My wife and I have both been collecting them separately and together for years! We collectively have over 20 of them. Anyway, back to the mugs. Starbucks offered plastic tumbler mugs with a lifetime warranty. They fit perfectly into our water bottle holders, and inevitably we would wipe out, hit something or get hit by a car, and the tumbler would break. We would go back and get a new one. Starbucks used to offer any drink of your choice when you got a new travel mug. What a good deal! After buying a mug for $9.99, I picked a $4 drink and then got two or three free replacements before the guilt would start to kick in, and I’d buy a new one and start the cycle again. Needless to say, the lifetime warranty is a thing of the past! My friend Jeremy recently came back from Seattle and brought me back the mug above from the first Starbucks store! I love it! As I do with every other one I have. My mom travels often. Each time she goes to a developed country she picks up a starbucks mug featuring the city she is in and gives it to my dad when she returns. He has starbucks mugs featuring places all over the world! My parents went on a European trip and came back with a mug from Paris and Duseldorf. It was pretty cool. It’s the modern version of tea spoons from around the world! Next PostNext Is Anonymous going to takedown Facebook on Nov 5th?